Truly my favorite thing about New York is being able to wake up, decide you want to see a Broadway show, and go. That’s what I did Saturday when I saw a matinee of “It’s Only a Play.” I’ve been wanting to see it since it opened in the fall, and I think cold January Saturdays where you have nothing planned are the perfect days to do things like that – stuff you don’t prioritize in the warmer months or around the holidays. The play was hilarious, and I’d be lying if I said I didn’t partially want to go because so many actors I enjoy are in it. Like Martin Short, Stockard Channing, Matthew Broderick and my newest favorite, F. Murray Abraham. Plus, Jonathan from 30 Rock! The dialogue drips with cultural references and there’s a high name-drops-per-minute ratio. The cast worked really well together, and it’s just a lot of fun. Martin Short has the stage to himself for many of the play’s first minutes, and he did one of the funniest, most engaging bits I’ve witnessed live. Like he was just telling the audience, enjoy this. Watch what I can do. 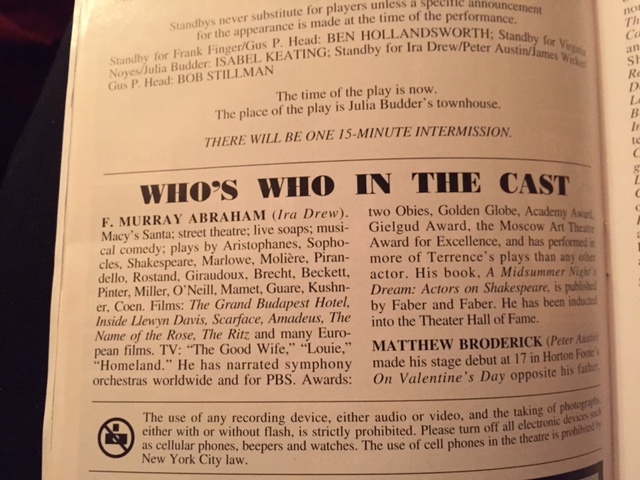 But perhaps my favorite part of the whole experience was reading F. Murray Abraham’s credits in the Playbill. The man has won an Academy Award for Best Actor and lists his first credit as “Macy’s Santa.” That’s why he’s great. And why I’m scheming ways to spend more of my winter days at Broadway shows. My sister and I more or less have a rule that we see a Broadway show when she’s in town. We don’t follow theater too closely, but right now there are two shows we really want to see: You Can’t Take It With You, and It’s Only a Play. We saw the former last night, and it was lovely. I’ve seen high school and college performances of this play before (it’s a Kaufman & Hart classic) but never a professional one. Of course a Broadway production is going to be of a different caliber than a high school show, but I don’t think that was what made me look at the play differently this time. I think it was the fact that I’d never seen Penny Sycamore played by someone who could actually be a middle-aged mom, or the Grandpa played by someone who could actually be a grandpa. That someone who could actually be a grandpa, by the way, was James Earl Jones. As you’d expect, he was amazing, delivering perfectly timed one-liners and kind of just sitting there grinning the whole time. It almost felt like he was grinning at the spectacle before him, simply joyful because he got to be in this weird little family in a fun little play. And it just so happens that sitting there grinning works perfectly for the character. There was an interview in the Playbill with Kristine Nielsen, who plays Penny Sycamore, matriarch of the crazy family around which the show centers. “This play is about collectivism. It is ‘take care of each other,'” she said while discussing her role. I liked that. During the show, I kept thinking of The Royal Tenenbaums. A movie, not a play, but still a story about a family that’s slightly…off. No one is normal. They have spats and disagreements. They can be ashamed of each other. But they also know they’re family. They take care of each other. We’re all a little off, but we take care of each other anyway. That’s family. The family you’re born into, and the family you create for yourself among friends. Either way, I know I’m lucky to have mine.